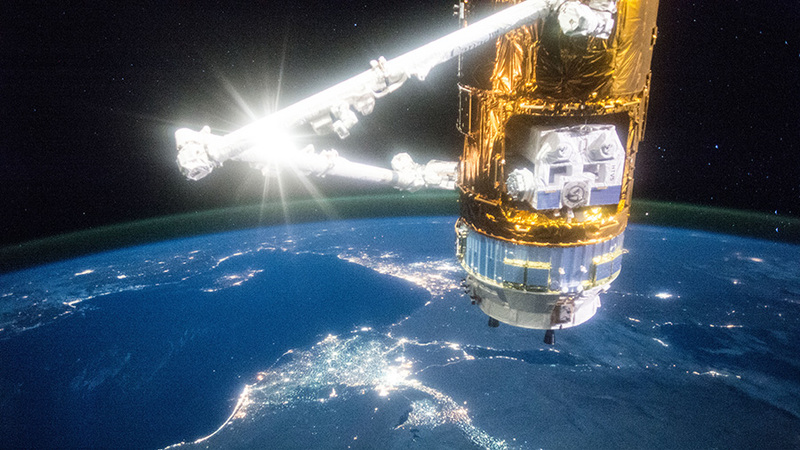 Japan’s fifth resupply ship, the HTV-5, is seen illuminated attached to the International Space Station during a night pass above the Nile river on Sept. 23, 2015. The unpiloted H-II Transfer Vehicle-7 (HTV-7) is loaded with more than five tons of supplies, water, spare parts and experiments for the crew aboard the International Space Station. NASA also will provide live coverage of the arrival of HTV-7 at the space station Monday, Sept. 17 beginning at 5:15 a.m. ET. Capture is scheduled for around 6:50 a.m. After a break, NASA TV coverage will resume at 9:30 a.m. for spacecraft installation to the space station’s Harmony module.